Malayalam song recordings are the longest sessions that I have ever logged. The sessions usually last 4 hours on an average. Even if one syllable goes wrong in a line of singing, there is no adjustment, there is no "its OK." We will have to redo the line. Even if it takes a lot of time, they make sure that the pronunciation is perfect and there is absolutely no compromise. And so far apart from one song for Sri Kaithapram Vishwanathan, which was not a Malayalam song, I sang Enna Thavam Seidhanai for Thilakam, and one Christian Devotional song, I have sung mostly for Sri M Jayachandran. At that time, he told me that they rarely ask Non Malayalees to sing Malayalam songs. And that he wanted to see whether I can sing Malayalam properly. Thereafter I have recorded about 8 songs or so for him. My first ever song was for Swandham, an album for East Coast Vijayan, for Sri M Jayachandran. He wanted me to sing this particular solo track - Poonkuyile - in this album. Right from taking the pains to teach the language and to make sure it comes in the recording, he devoted a lot of time for the sessions. I have absolutely enjoyed singing for him every time. One such song (Karthikappoo) that I recorded for him was from the movie Bharathan which released last year. I went to record a song for him last evening and it was only now that I could ask him, a year after the movie released, about the name of the movie. I guess after Kannathil Muthamittaal, this was my second song with Sri P Jayachandran. There are a couple of title songs for Serials that I sang for him, one started as "Ah Amma" and the other was "Padayaatrayo Janman parayu sakhi". I don't know the names of the Tele serials though. But I hope to get these two songs from him soon. They are beautiful compositions and I was lucky to be a part of them. Karthikapoo is now in my audio blog. Excuse the quality, I could not find a better version. Probably if and when I go to Kerala, I have to make a note to get the CD there and upload a better version. Another feather in your linguistic cap....way to go Chinmayi! Enna Thavam Seidhanai for Thilakkam is one of my fav songs - esp with the picturisation of that song and ur voice!! AWESOME!! 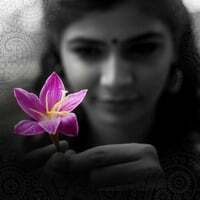 Hi Chinmayi, I consider it a privilege to be a follower of your blog. I do wish more singers, and esp those who frequently sing for ARR, would blog (of course if the man himself blogs, that would be sheer bliss). Can't wait to hear your rendition of Munbe Va at the Chennai concert - I am excited to hear how you would have sung differently from Shreya (who I absolutely adore as well)! Anyway, being a silent reader so far, what prompted me to write in is this post where you were wondering about the name of the teleserials you sang for for which Sri M Jayachandran had composed the title songs. Not sure of Ah Amma , but Padayaatrayo is from Maalayogam. I am by no means an avid follower of tv serials, but so happened to watch this one in particular for a few months, and your title song was definitely a huge draw. Thought I owed you this much, for all the precious insight you have given on working with Rahman. I know we Malayalees can be picky about pronunciation, and boy are we hugely impressed when someone like you gets it right :) I had listened to Swantham long time back but had no idea you were the same singer who melted hearts with Oru Deivam Thantha Poove, and later sent me into raptures with Tere Bina! Keep the music alive - may Vani Veena Saraswathi frolic in your voice forever.